What can governments do to seize the opportunities of globalization, while minimizing its downsides? Getting the balance between markets and government right will be key to improving the people's standard of living and overall welfare. In a more globalized and complex economy, governments have fewer levers to pull, and these levers are less potent than before. The choice is not between big government and small government. What matters is what governments do, not how big they are. Economic policy is at an inflexion point. The financial crisis of 2008-09 has altered the way we perceive markets. The idea that competitive markets are sufficient to ensure efficient outcomes and stable economies is under heavy intellectual fire. What kind of new economic ideas will emerge from the crisis? <!-strCallout1->This question is not just about economics. The crisis has prompted a fundamental re-think of the relationship between markets and governments. The contest is not just between economic theories, but between competing systems of political economy and models of governance. What is the role of governments in promoting economic growth? Despite the pressing nature of these questions, we have to recognize that the tension between markets and government is not new. In fact, it has been the central issue in the evolution of political economy over the last 200 years. There have been three distinct phases in this evolution. The “rise of the market” began in the late 18th century, shaped by the writings of Adam Smith and David Ricardo. The “invisible hand” of the market guided supply and demand toward equilibrium and efficiency. Free trade promoted specialization along the lines of comparative advantage and fostered economic growth. There was no need for central planning, beyond providing public goods like law and order. There was no macroeconomics as such — no monetary policy, no fiscal policy. This phase came to an end in the 1930s, when the concept of self-correcting markets collapsed under the weight of the Great Depression. Falling prices, instead of bringing demand and supply into equilibrium, locked the world into a deflationary spiral. Thus began the second phase. It was John Maynard Keynes who argued that markets were inherently unstable. Left on their own, they may not always self-correct. Government intervention was necessary to boost aggregate demand during periods of high unemployment. 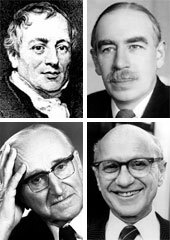 From these observations, modern macroeconomics was born. <!-strCallout2->The rise of government went beyond managing aggregate demand. The 1940s also saw the advent of the welfare state. Following the Beveridge Report, the United Kingdom — and soon, the rest of Europe — embarked on providing social insurance for health care, education, employment and social security. The welfare state was enabled through redistributive taxation and government regulation. Across the Atlantic in the United States, Lyndon Johnson’s “Great Society” of the 1960s expanded the role of the state in the pursuit of social justice. This phase began with growing disenchantment with government’s ability to deliver and was driven forward mainly by U.S.-based economists — although the problems they sought to address manifested themselves all over the developed world. The stagflation of the 1970s — persistently high inflation and unemployment — called into question the ability of governments to fine-tune the economy. Meanwhile, the welfare state began to impose an unsustainable fiscal burden, not to mention a creeping entitlement mentality among the people. Friedrich Hayek and Milton Friedman led the charge against “Big Government.” They argued eloquently how an overreaching government dulled the fundamental human instincts that power the capitalist system: initiative, enterprise and the competitive spirit. The idea that markets — for all their faults — were more effective than governments in allocating resources and driving structural change, gained ascendancy. In the 1980s, U.S. President Ronald Reagan and UK Prime Minister Margaret Thatcher reduced taxes, deregulated industries, privatized state-owned enterprises, curbed union power, and scaled back welfare programs. The global economy boomed. The collapse of the Soviet Union and the opening up of China seemed to vindicate the triumph of market capitalism. The Washington Consensus held sway from Bangkok to Budapest. The third phase ended in 2009 with the onset of the global financial crisis and recession. We are once again at an inflexion point, but with no clarity on the paradigm going forward. <!-strCallout3->The financial crisis has revealed significant imperfections in market mechanisms: information asymmetry, moral hazard, systemic risks and behavioral or nonrational motivators of choice. It has also revealed the inherent limitations of government: In a more globalized and complex economy, governments have fewer levers to pull, and these levers are less potent than before. Neither market fundamentalism nor central planning has worked. Yet one thing is certain: The choice is not between big government and small government. It is about creating effective government. What matters is what governments do, not how big they are. The size of governments may well have to shrink. (The revenue base in most countries will be capped by competition and demographics.) But the responsibilities of government may well have to expand — to enable, regulate, stabilize and legitimize markets so they can work better. Getting the balance between markets and government right, then, will be key to improving the people’s standard of living and overall welfare. 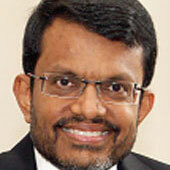 Ravi Menon is managing director of the Monetary Authority of Singapore, the country's central bank.